Pope Saint John Paul II wrote a personal letter to the Order of Preachers, in which he encouraged the Order to continue “preaching the Gospel for the salvation of souls.” By the grace of God, the holy preaching continues by preaching the Word through various forms of evangelization; teaching and scholarship; parochial service; and foreign missionary work. With you I feel at home. I am sure that the Church and its universal pastor can count on your collaboration, as you have always done, in the arduous task of the evangelization of the world. Saint Dominic founded your Order precisely for this task. It is for this reason that it was approved and sent by the Church. Your “mission” is always the same one. My predecessor Honorius III, writing to Saint Dominic on the 18th of January 1221, acknowledges that it was inspired by “Him who allows His Church to bring forth a progeny that is always new”. It is the mission “of consecrating oneself to preaching the Word of God, proclaiming throughout the world the name of Our Lord Jesus Christ.” In fact, “the Order of Friars Preachers, founded by Saint Dominic, ‘is known to have been established, from the beginning for preaching and the salvation of souls, specifically’. Our brothers, therefore, as the founder prescribed, ‘should everywhere behave uprightly and religiously, as men intent on procuring their own and other people’s salvation; they should behave as evangelical men, following in the footsteps of the Saviour, speaking to God or of God, among themselves or with their neighbours’” (Constitutio Fundamentalis, § II). 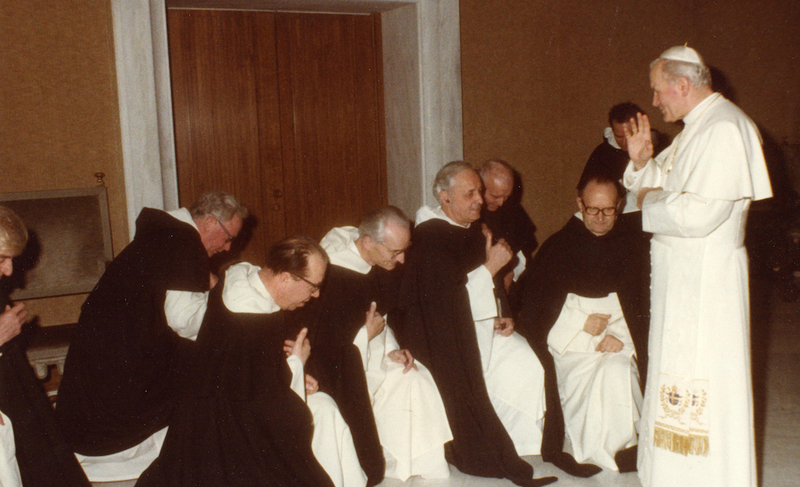 “To ensure that by following Christ in this way we would perfect our love of God and of our neighbor, we consecrate ourselves entirely to God by profession, thus becoming members of Our Order and dedicated in a new way to the universal Church, fully committed to preaching the word of God in its totality” (Ibid § III). In so far as the Order remains faithful to such demands, tomorrow as in the past, it will participate intimately in the work of the universal Church, and will be particularly close to the Bishop of Rome. In order to fulfil its mission, your Order has to remain faithful to those guidelines that go back to the fundamental text that I have read to you. They are the principles of faith which theology has developed along with the great Doctors, among whom Saint Thomas Aquinas shines with a special light. The Church continues to propose these principles as the foundations of Christian wisdom and as the axis of apostolate. The first of these principles is that which affirms the absolute primacy of God in the intelligence, in the heart, in the life of man. You know well how Saint Dominic responded to this requirement of faith in his religious life: “He spoke only with God or of God.” You also know how, on the level of doctrine, Saint Thomas Aquinas, beginning with the Sacred Scriptures and the Fathers of the Church, envisioned this primacy of God and how he supported it with the force and consistency of his metaphysical and theological thought, using the analogy of being which permits the recognition of the worth of the creature, but as dependent on the creative love of God. And then, on the level of spirituality, Saint Thomas is completely of the school of his Father, Dominic, when he defines the religious as “those who place themselves totally at the service of God, as if offering a holocaust to God.” (S. THOMAE Summa Theologica, q. 186, a. 1 et a. 7).